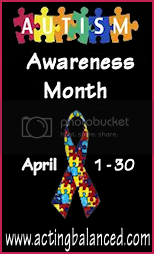 Starting April 1st, 2011 and ending April 30th, 2011 I will be posting articles, reviews, guest posts and giveaways in support of Autism Awareness Month (AAM). This page will be the permanent link for all things related to AAM. Autism has touched my family in many ways, including when my son was diagnosed at the age of 26 months and every day since. If you have a story to share about Autism and how it's touched your family, there is still time to participate - just shoot me an email at heather@actingbalanced.com and I can send you the guest post guidelines. Please grab the Autism Awareness Month button from -----) and share it on your blog or webpage if you have space available!